The Pineapple Express is really the story. What is it? It's a pipeline of Pacific moisture guided into the West by an active jet stream. It will eventually come to an end in California first and then Utah, New Mexico and Colorado last. It doesn't look like a banner five-day stretch for the Northeast. Colorado, Utah: The Pineapple Express continues on Thursday in Utah and Thursday-Friday in Colorado. Snow may linger into Saturday morning in Colorado. Generally a foot of accumulation in Colorado between Thursday and Friday at the ski areas. Crested Butte, Aspen-Snowmass, Monarch and Steamboat are in the best position. 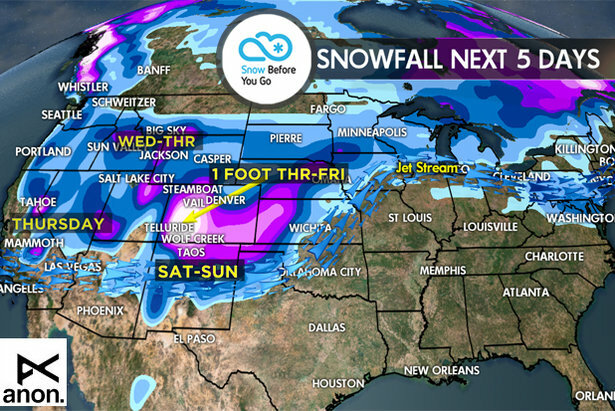 The entire storm dives south and may then hook back into Colorado on Sunday-Monday with one final snowfall. The southern mountains of Colorado would be in the best shape for that final snow. New Mexico can expect heavy snow accumulations Saturday, Sunday and early Monday. That includes Taos and Angel Fire. California: The Pineapple Express delivers snow to the ski areas on Thursday then tapers off. A dry stretch from Friday through Monday. 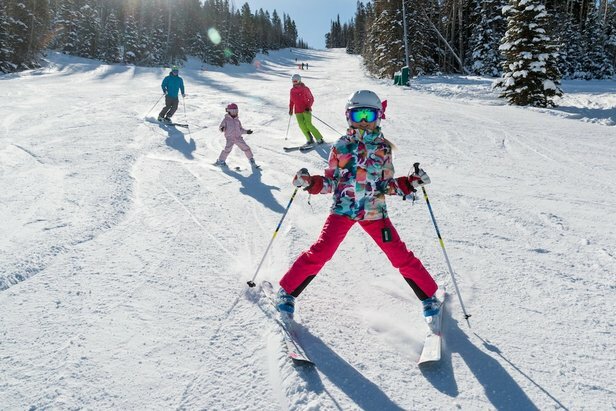 If you plan to ski, then take advantage of Friday when most resorts will finally open. Leftover powder through the weekend. Wyoming, Idaho, Montana: The Pineapple Express flow dries up on Thursday afternoon. That leaves all three states with a rather dry weekend overall. Some good leftover powder, but nothing new until next week. So, if you ski Jackson Hole, Grand Targhee, Sun Valley, Big Sky or Schweitzer, do it on Thursday or Friday for the best powder. Pacific Northwest: The Pineapple Express flow dries up on Thursday. It looks like a rather dry weekend until Sunday-Monday, when the next storm system slides in. Whistler/Blackcomb: No significant snow accumulations until late Saturday into Sunday and Monday. Northeast: I'm forecasting a warm storm with mostly rain on Thursday and it turns over to snow late Thursday into Friday morning. A storm may brush the area with light snow late Saturday into Sunday morning, but confidence is low. Otherwise it looks rather dry.